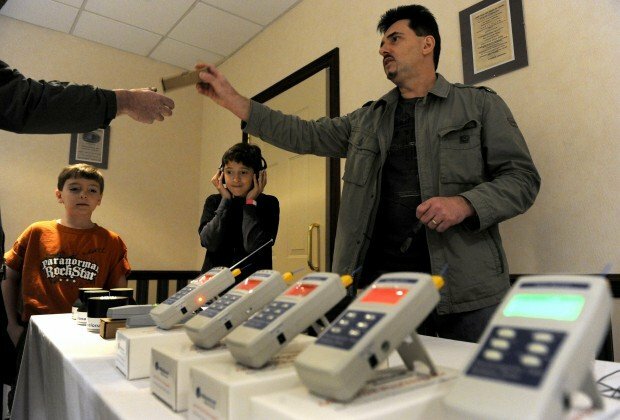 Jeffrey Fehder - jfehder@poststar.com Gary Gilka, right, sells one of his electro-magnetic field detection devices to Matt Thomas, not pictured, as two sons Nicholas and Brandon Thomas listen to recordings of paranormal readings during The Adirondack Paranormal Society (TAPS) clinic for amateur ghost hunters at the Fort William Henry Conference Center in Lake George on Saturday, April 17, 2010. Jeffrey Fehder - jfehder@poststar.com Syd Schultz speaks to a crowd of ghost hunting enthusiasts during The Adirondack Paranormal Society (TAPS) convention at the Fort William Henry Conference Center in Lake George on Saturday, April 17, 2010. Schultz resides in Los Angelos and stars in the television show Ghost Hunters, where he uncovers paranormal activity on camera. LAKE GEORGE -- With a single flashlight lit, eight people gathered in the armory room of the Fort William Henry on Friday night. "This is the where they stored the gunpowder and the soldier who used to stand watch still thinks he's guarding this place," said Fred Austin, the resort's resident expert on paranormal activity. Austin looked up at the ceiling and yelled "I think somebody's going to light a match down here." An instant later, there was a loud bang - and no one could tell who or what had made the sound. "See, he didn't like that," Austin said with a smile and left the group to continue their investigation. About 60 people gathered on Friday night to walk the grounds of the Fort William Henry Resort and replica fort to search for proof of paranormal activity that countless people - guests, employees and others - have reported encountering. The 9 p.m. to 2 a.m. investigation was part of the TAPS Paranormal Boot Camp, a weekend-long program led by The Atlantic Paranormal Society geared towards novices interested in learning how to detect and interact with the spirit world. Hours before the investigation unfolded, those would-be ghost trackers were broken into training groups and sent out into the field to study. 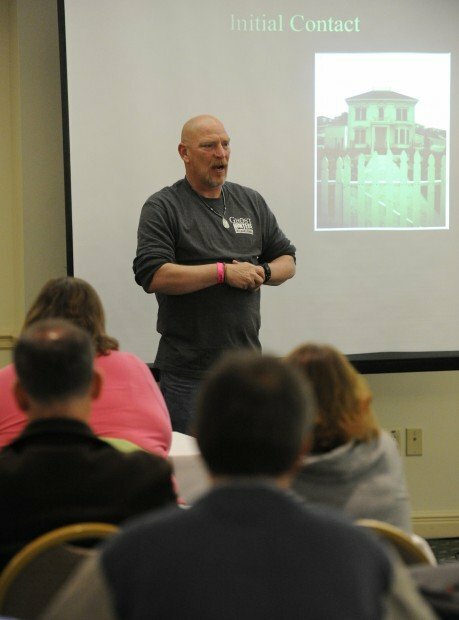 TAPS coordinator Syd Schultz II led paranormal seminars through the day to teach how to use the tools of his trade, including EVPs - electronic voice phenomenon readers - and EMFs, electromagnetic field readers. The fort was chosen because it's known as a hot spot for paranormal activity, said Austin, Fort William Henry's ghost guru. The site was home to a massacre in the mid-1700s during a war between local Indians and British soldiers. TAPS works with the SyFy show "Ghost Hunters," and Schultz said another reason to host the training there was to do some research to see if the site could be featured on the show. Tools in hand, the experts and the trainees did that research on Friday night into Saturday morning. Dustin Brill, of Pennsylvania, thought he experienced the power on an EVP first-hand, after he and several others in his group were convinced a ghost had responded to his question. Brill's group was in the fort dungeon, which Austin said used to be the location of the field hospital. When the fort was stormed by the French Indians, Austin said the wounded soldiers in the field hospital were scalped and disemboweled there. After Austin told the tale, they settled in and tried to make a connection with whatever spirits may or may not have been lingering. Brill was one of the first boot campers to ask it a question. "I am a lance corporal of the U.S. Marine Corps, my name is Dustin Brill and I have seen what you've seen and I understand what you're going through," he said. Seconds later, paranormal investigator Aron Houdini yelled from across the room: "You guys got to hear this." Playing back the EVP recorder, you could almost hear what sounded like a man's voice groaning "aahhhh," a noise the investigators said didn't come from anyone in the group. Austin said one medium once told him while in that room, she'd spoken with a man by the name of Richardson. Later, looking through records, Austin said he found a man who died at the fort with the last name of Richardson listed. But Dustin Pari, a paranormal investigator on "Ghost Hunters International," said that despite his involvement in paranormal research, his first instinct is to be skeptical of stories he hears. While Pari, 32, said he has seen enough throughout his 17 years as a paranormal investigator to totally believe in the spirit world, he wants proof - like what Brill and his group heard. Pari, though, did say that the late-night timing on spirit hunting was more about effect, rather than a guess at when paranormal activity is at its peak. "Activity in broad daylight is just as cool as if it happens at night," he said. This is scarrrry but....last night?...I saw a GHOST!! I think I saw our....(gulp)...Constitution! Aaaaahhhhhhh!!!!! !